What is the Flow Preview Program? Microsoft Flow updates every few days or weeks. The Flow Preview program is a way to get early access to those upcoming functionalities and updates, prior to, them being available in rest of the world (where your flows are normally deployed). Try out, learn, and dogfood upcoming functionality. Much of our functionality will be rolled out first in preview, for a minimum of a few days, to get feedback. By participating in Preview program, you can learn about new capabilities sooner, and as well provide feedback on it. Also, you will be ready to quickly take advantage of new functionalities as soon as they reach regions where the remainder of their flows are created. Enable business continuity by ensuring their current flows will continue to work with the upcoming updates (vNext) of Microsoft Flow. 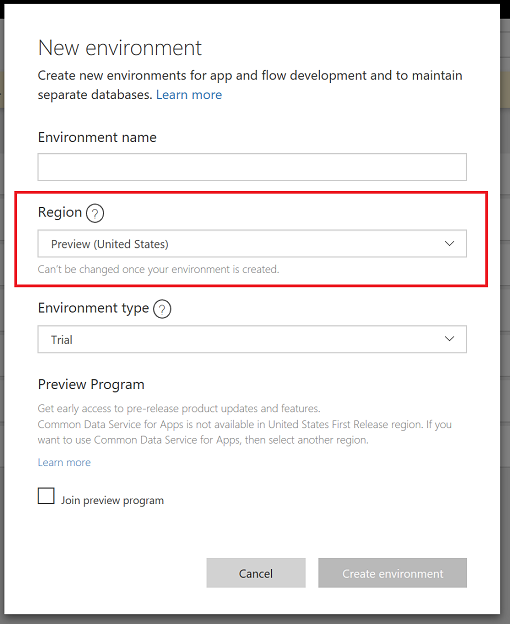 On selecting the region for the environment as Preview (United States) and accepting the consent for joining the Preview Program, you can create the environment to get access to the next version (vNext) of Microsoft Flow. All the flows and other resources created in this environment are on vNext version of platform. You can learn about new functionality available for preview in the Microsoft Business Application Release notes. You might like to verify your production flows, to work with the next upcoming updates on Flow. You can copy the flows from a production environment to an environment in Preview to test out the scenarios by using the Import/Export feature. Please note, all the other necessary resources like Custom Connectors, PowerApps, etc. will also need to be moved along with it. This should just create another copy of these flows and required resources, and you can start testing out the newer updates not just for running the flow, but also while editing and managing the flow. To provide feedback to the product team join the Microsoft Flow community and post there. Currently, you cannot create a database with Common Data Service for Apps in an environment in Preview (United States) region. This means features that dependent on the Common Data Service, such as Flow Approvals and Business process flows, will not be usable in a preview environment. We plan on adding this in the near future. The Flow mobile app only has one version at a time. The mobile app can connect to a preview environment, but there is no way to test out new versions of the mobile app at this time.